Oh, no worries if you don't own Instant Pot. 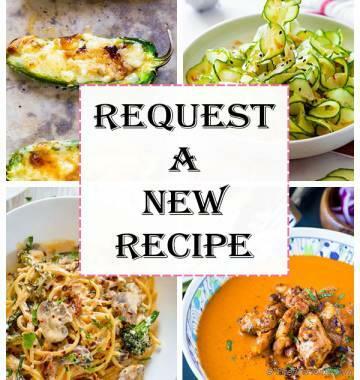 Recipe includes directions to both, cook Chili in Instant Pot or Dutch Oven (regular cooking). Who does not love a good Chili for summer cook offs? We look forward to some healthy competitions, chili tasting, and delightful variations of chili mac and cornbread drunken chili (my favorite). 2) "No Wait" Chili: To take "wait" out of chili cooking. 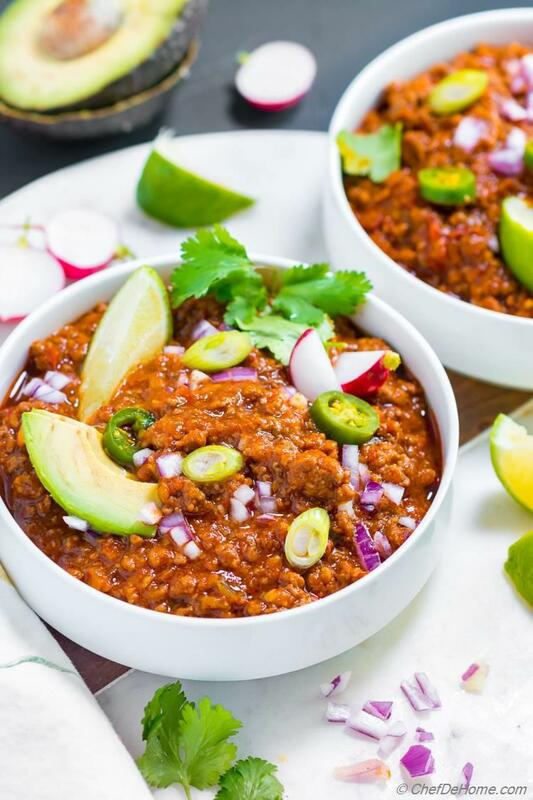 With Instant Pot method to cook chili, this chili can be prepared way less time. It tastes like a good quality restaurant, with 10 varieties of American chili on menu. Most Chili served in restaurants are loaded with beans. This is how we know chili. Isn't it?. But, did you know the original American chili had no beans? Beans were introduced to chili to 1) increase the quantity 2) Balance the flavor of spices. Beans are famous in Tex-Mex chili. This shows the blend of two cuisines - American and Mexican. 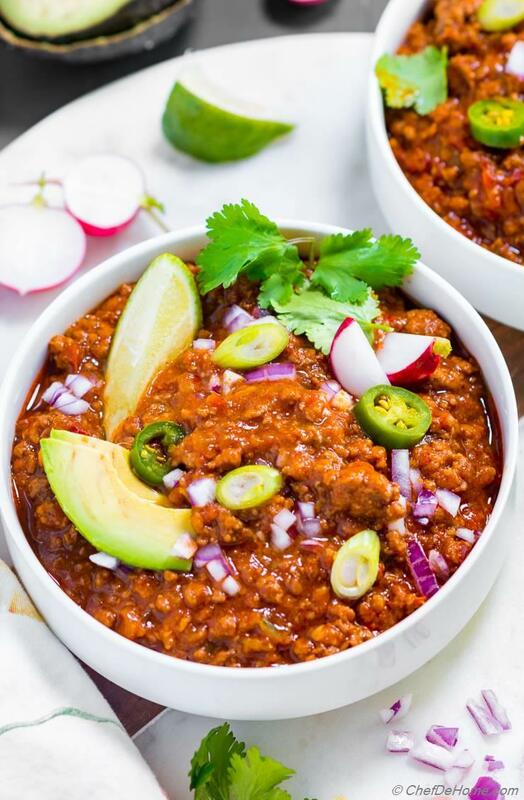 I'll save another day to share more on Tex-Mex Chili but today's recipe to share original true flavors of meat and spices a.k.a Chili Con Carne. Chili Con Carne means chilies and meat where Chili stands for chilies used and Carne stands for meat. 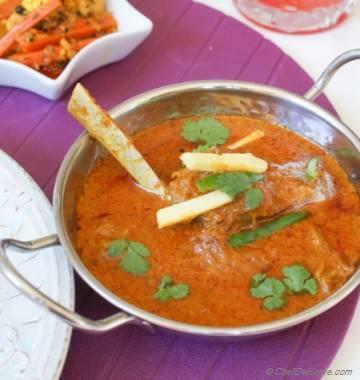 With this recipe, I wanted the flavor of meat and spices (specially chilies) to shine. In short. 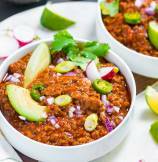 if you are fan of all-meat chili, this recipe will become regular in your dinner menu. I only request to follow the instructions on Recipe Card thoroughly. Instant Pot (specially the Pressure Cooker setting) is my favorite tool to cook food at moment's notice. It cooks food fast, under pressure which also preserver nutrients, and yields tender meats, soft beans without any perching on stove. For all Instant Pot Chili Recipe, I always make sure to use right quantity of liquid, and seasonings. Right quantity of liquid is the key when cooking in Instant Pot. Too much liquid will make food soupy and too little will scorch. Seasonings brings out the flavor of meat. Well seasoned start yields good flavor in IP. To cook Chili in Instant Pot, I start by most important step to making any good chili i.e. browning the meat. If you own a large Instant Pot, this step is quick as you can brown meat in less number of batches. Don't worry if you own a small pot, use regular pan and brown meat on stove top. Make sure to discard oil and watery residue. Only use drained browned meat for the chili. Note: This step is also applicable to when cooking chili in dutch oven. Browning the meat seals in juices, renders fat and moisture. The resulting chili has way more good flavor than one made with raw (not-browned) meat. 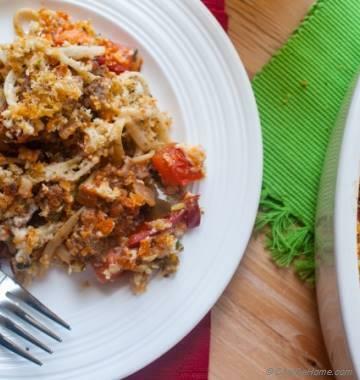 Tip: I only used ground meat for this recipe. You can also add small chopped stew meat in chili for chunky texture. 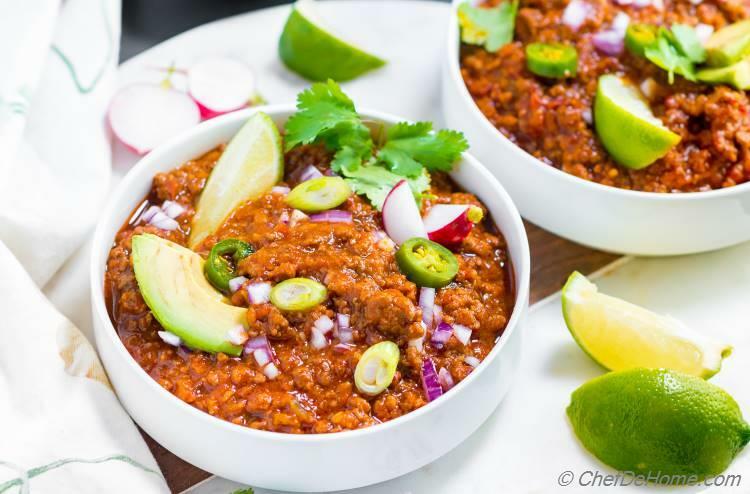 What makes this Chili Stand-out? Beer: One of my favorite chili ingredient. The flavor it adds to chili is always spot on. To me, it is as important as adding stock for flavor. Plus it also helps tenderizing the meat. We don't need that here since Instant Pot is doing that job well. But if you using Dutch Oven, beer has double benefit. Chilies: I often find chili spice mixes leaving a gritty taste in chili. To fix this, I use re-hydrated dried chilies or prepared chili sauce for Chipotle and Ancho. You can't get the aroma, flavor, color of fresh chilies from chili spice mix. Ancho is a fruity chili, not that spicy. A quick soak in water for 10 minutes makes the skin softer. I always remove seeds before soaking. If you soak with seeds, make sure scrape out seeds before using it for this recipe. Tortillas: The best way to thicken the chili is Corn Tortilla Chips. This is a little restaurant secret which is quick and yields consistent results. Instead of storing a bag of masa (corn flour) in pantry to make roux for chili.. I add 10-15 fried tortilla chips. (a 1/4 bag of leftover chips hanging in kitchen is best used here). Chips cook with chili, add hint of flavor of corn and make chili thick and delicious. Honestly, I have invested so much time in making homemade chili a tasty comfort food that if this recipe is wrong, I don't want to be right. Total Time 60 minutes Prep Time 20 minutes Cook Time 40 minutes Difficulty Easy Yields 8-9 Cups Serves 4 Notes No. of servings depends on serving size. 1. In food processor jar, add garlic cloves, tomato paste, chipotle, ancho chili (soaked and drained reserving 1 tbsp liquid) with reserve liquid. Blend until purred. Transfer to a bowl and set aside. Don't dilute paste too much but you can add a tbsp more soaking liquid/water if this makes processor's work easier. 2. Heat cooking oil in a heavy bottom dutch oven pot or Instant Pot at medium saute setting. While pot heats, season ground meat with 1/4 tsp salt. 3. Brown meat in the pot in two-three batches. Transfer brown meat to a bowl, drain off excess fat/liquid as much as possible. 4. To the empty heating pot, add onion and bell pepper. Cook until onions are soft (2-3 minutes). Add all spices with a teaspoon of salt and chili paste prepared in step 1. Cook for 1 more minute. Deglaze pot with beer. Add purred tomatoes, and browned meat. Mix well. 5. Instant Pot - Add 3/4 cup of stock, crushed tortilla chips and mix well. Place the lid and lock. Cook on Manual - High for 22 minutes. Let pressure auto release in 10 minutes. Open lid, mix everything again. Taste and adjust salt. (Add more stock to adjust consistency of chili as per preference. I add up-to 1/2 cup more stock for consistency shown in pictures.). Dutch Oven - Add 1.5 cup of stock, mix well. Cook on medium-low heat for 1 hour or until chili is thick and meat is well cooked and tender. If liquid is too less, add more stock/water. After 1 hr, add tortilla chips with half cup more stock/water, and continue cooking for 20 minutes or until chili thickens to your liking. 6. Ladle chili into bowls. You can also add beans when serving (check notes). I love to add a piece of warm corn bread in bowl before ladling chili on top. 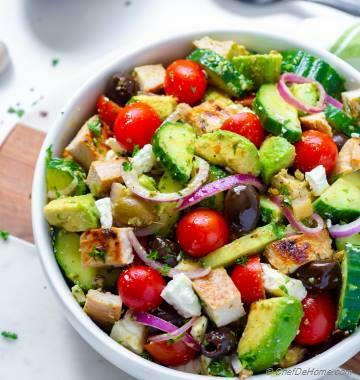 Add/or mix toppings of your choice. (More on my favorite toppings in description). Make this chili bowl your own favorite. Serve and enjoy! Cook Time: Instant Pot cooks chili in about 22 minutes. 40 minutes cook time also includes time to brown the meat. Saute veggies etc. More Chunky Chili: I only used ground meat for this recipe. You can also add stew meat (small chopped) in chili for chunky texture. 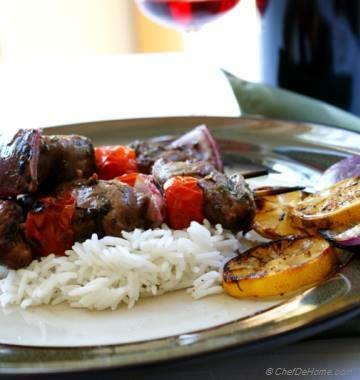 Meat: Lamb/Goat is the only red meat we cook in our home. If using other meats please adjust the cooking time based on Instant Pot Instruction Manual. For dutch oven method, follow same instructions. Only eye ball/check the texture after when time mentioned in recipe above is up. Add more liquid, cook longer until texture is per your preference. What a fatastic tip to add crushed tortilla chips to the dish! It looks divine. Shinta, thanks. Crushed tortillas chips is such great way to thicken the chili. Plus chips are easier find/manage than making roux from scratch. I'm gad you too find this useful. 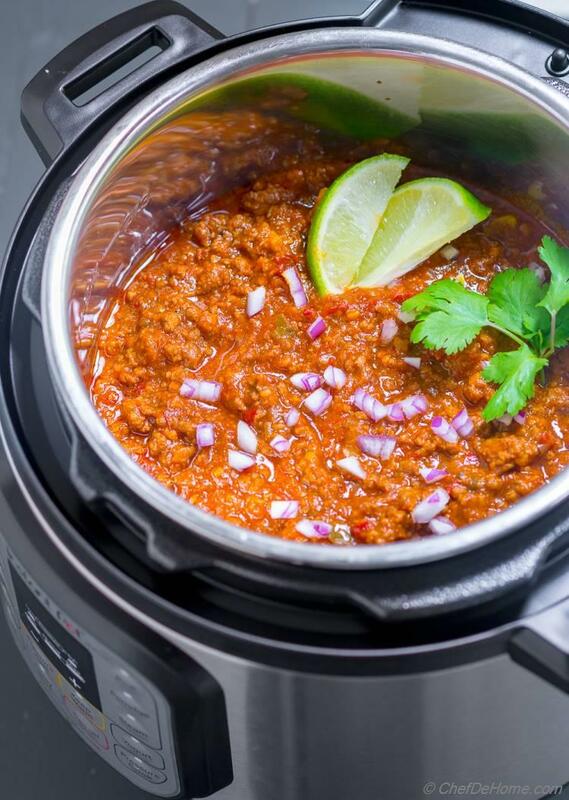 I still havent tried making a chilli in the instant pot, need to try this one! Thanks Amy. I hope you get chance to try it soon. I do like beans in a chilli, but this looks just as good without. This is total comfort food. I agree, chili is one delicious comfort food. You can certainly add beans. Also, can serve beans on side. That way everyone can build their own chili. This looks so hearty - I just wanna dip my spoon into that Instant Pot and forget about using a bowl! 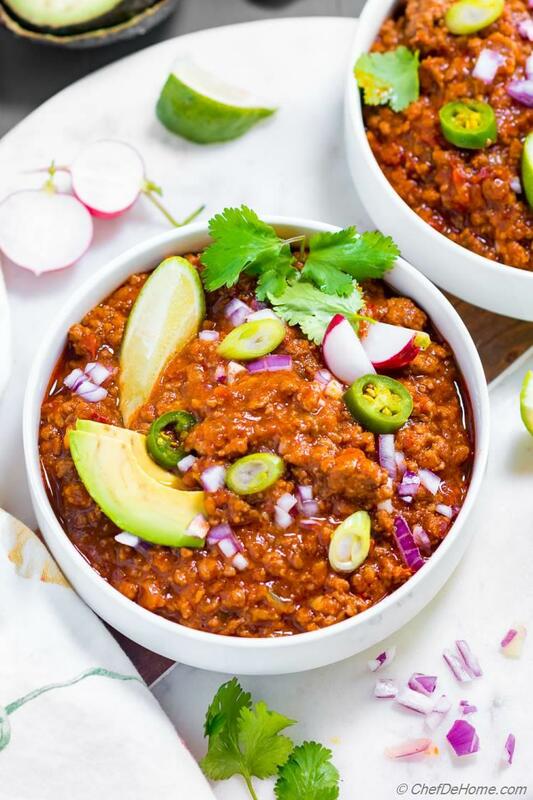 What a delicious chili recipe! I didn't know that the original American chili recipe didn't contain beans. Love all the tips you provided too! Pinning this one! Thanks Marie. I'm glad you found these tips and some history of chili useful. Chili without beans is favroite of some of my family members and some still want chili with beans. What I do is, get chili beans and serve on side for anyone who wants chili with beans. That way everyone is happy. Thanks for stopping by. Beef the best. Lamb? Need to try this one. Seems like a great Lamb and Chili blend. Even though you can use any meat you prefer, I recommend trying lamb. I hope you get chance to try it soon.